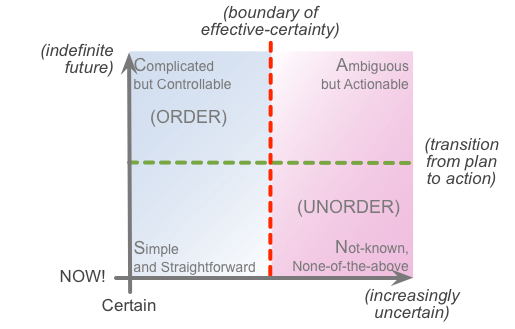 The SCAN framework describes sensemaking and decision-making in terms of four distinct ‘domains’, by convention labelled as Simple, Complicated, Ambiguous and Not-known. But what happens at the edges? In an ecosystem, most of the most interesting things happen at the edges. And it looks like much the same would be true of SCAN: what’s come up in the past few weeks is that the edges between domains – the transitions between different overall approaches to sensemaking and decision-making – seem almost to be the key to the whole thing. I introduced this notion of edges in SCAN, in a lighthearted way, in the slidedeck for my presentation at the Integrated-EA 2014 conference. What I’ll do here in this post is provide a bit more detail. The next sections describe in turn what happens at each of these edges. 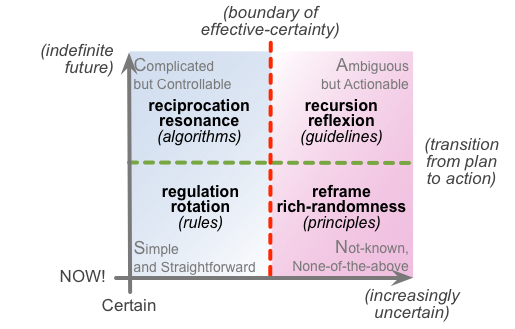 We can see this happening recursively in contexts such as help-line service, where the realities coming ‘upward’ from one level have to be escalated to successively-higher levels of Complicated in order to be resolved, and then finally filter back down again as successively actionable ‘rules’. 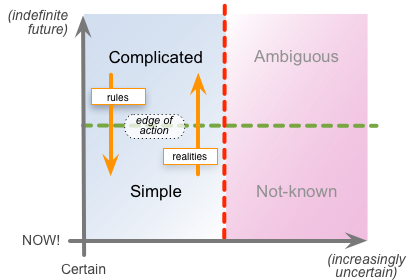 At each move ‘upward’, the focus moves further and further away from the immediate real-time contact, and requires increasing levels of ‘time to think’ – though note that each level, recursively, also has its own versions of Simple and Complicated, of action and ‘stop and think for a moment’ plan. It’s important to note that, by definition, the only place where anything new can be found is in the Not-known. 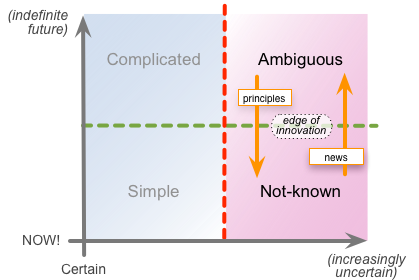 If we are to find the ideas and experiences we need for invention and innovation, we need to be willing to “become comfortable with being uncomfortable” in the Not-known, and to work with that ‘the unknown’ in real-time, rather than only ‘from a safe distance’. 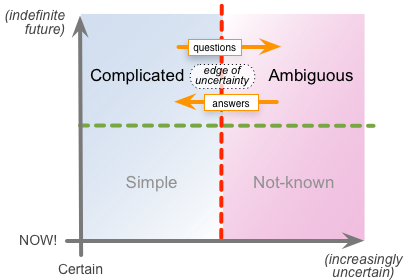 Note the symmetry here with the questions and answers that pass back and forth between Complicated and Ambiguous: the difference is that for the Simple::Not-known loop, all of this happens at or near real-time, and – for humans – often carries an emotional-loading that is not (or, ideally, should not) be so prevalent further away in time from the moment-of-action. 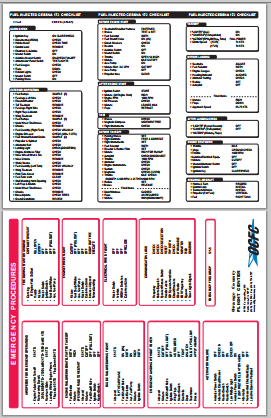 The routine checks (in black, in the checklist above) provide Simple rules to guide real-time actions – whose purpose is to minimise the risk of traversing over to the ‘uncertainty’ side of the context. 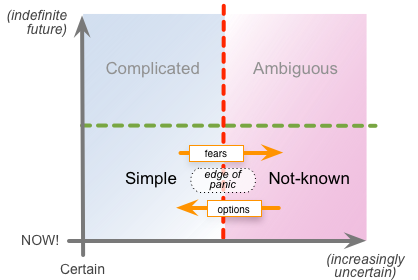 The emergency-checks (in red, in the checklist above) are called-for when fears arise as the context moves too far into uncertainty, and provide options that can be tested and acted-on in a Simple way – ideally returning the context to return back over to the certain/Simple side. 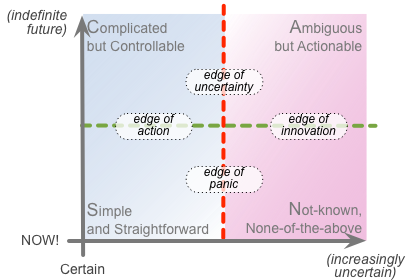 In any real-world context, all of these domains and edges will be in play in some way or other, all interleaving with each other at various distances from the respective moment-of-action, and at varying degrees of certainty or uncertainty. In that sense, all of the feedback-loops will be happening at the same time, in various ways and in varying levels of priority and relevance for the immediate context in play. The fundamental requirement here is “don’t mix them up!” – trying to use techniques from one domain in a different domain is usually not a good idea… (The one place where it can be useful in the Not-known domain, where the mismatch acts as a kind of reframe – in other words, as another form of recursion!) Hence, in turn, it’s really important to be aware of which domain is effectively in play at any given moment, and/or which edge is being traversed, and in which direction. Overall, yeah, all a bit technical, I know… But it really is worth the effort to step back a bit sometimes, and watch how all of this works in real-world practice – because it’s how we do get better at doing things more effectively, and in ways that we actually want.